Labeling something "Part 1" suggests at least a Part 2, so here it is. Well since I was going to move home shortly after doing Part 1, I figured I should do at least another comparison in another setup. The effects of the room are real, and contribute to different people's varying opinions of the same product, as well as the display sets sounding different than your own set at home. This will be an interesting lesson, for both me and you the reader. Something tells me that this location is not optimal for the Diamond 8.2, just a hunch. I know that this place makes speakers sound in general much better than the typical placement (of, y'know, big flat wall, speakers to the sides of the screen, far apart, may or may not be close to the back wall). Bass in particular is absolutely boosted and fantastic, besides improvements in other areas. Perhaps I should patent this. I used the Bose first for a while since I was busy unpacking everything and trying to fit everything into the space of an apartment in Singapore. The small size plus simple setup makes it wonderful for, erm, simple setup. 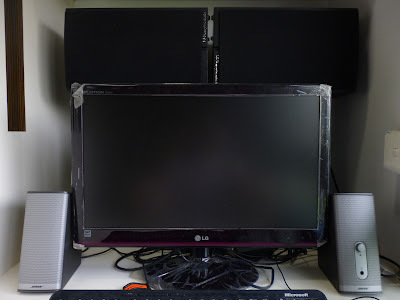 So I realized why computer speakers were invented despite sounding way worse than the large speakers before them. First impression of the Bose was, let me put it this way, the Bose had quite a bit of bass in Part 1 right? What happens when you put lots of bass in a position that provides lots of bass? It felt like someone had adjusted the tone control and set it to more bassy. If anybody complains that Bose is all bass and no treble, this is the kind of setup he has. 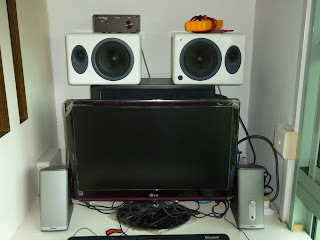 Although at the same time, Bose is only sightly more bassy relative to other bookshelves, so calling Bose "all bass" would require calling many other speakers "all bass". So I would suspect that these people haven't heard anything outside of computer speakers. Something good came out of this though. Previously the bass, though abundant, felt like it lacked the lowest of frequencies to support the higher frequency parts of the bass. Now it feels more complete. I felt that I could possibly live with the Bose instead of setting up the cumbersome bookshelves. Until I listened to the bookshelves anyway. This position does not seem to be optimal for the Diamonds, probably due to the lack of distance between the speakers. The lower-middle frequencies seem to be missing resulting in reduced warmth, and those middle frequencies that remain feel thin. Possibly from the woofers being so close together. Initially, switching between the two speakers (the headphone out of Xonar STX comes in handy), both speakers have their pros and cons, with the Bose sounding more appealing due to having less mid frequencies. The differences between the speakers is much more obvious this time. Previously (in the previous review) I thought that the difference in sound signature between Bose and Wharfedale is at the same scale as if not smaller than between (decent) bookshelves speakers. But this time they sound very different, with Bose sounding much more bassy and Wharfedale having more higher frequencies. But still the Bose has an obvious emphasis at a particular high frequency band. After using the Diamonds for a while and getting accustomed to the sound (a.k.a. burn-in), everything goes bad for the Companion 2. Now the Bose is totally unbearable compared to the Diamonds. Differences between speakers while in this setup are big, and the Bose doesn't cut it for, strangely, videos, and pretty much everything that relies on human speech and clear normal sounds. In a video, when it was a calm scene, I was getting bass overload with the Bose. It was abundant enough to tell something was wrong. (Although to be fair the Diamond 8.2, with their 6.5-inch woofers, is also slightly guilty of this.) Strangely, music still works, kind of, although some music work better than others. Gaming, the extra bass of the Bose comes in handy. If I switch from Companion 2 to Diamond 8.2, yea there is less bass, more mid, more treble. Everything you don't want in a speaker. That thought will last for about 5 seconds after which you feel that the Diamond's human voice and pretty much everything else too are way, way more correct-sounding than the Companion 2. If I switch from Diamond 8.2 to Companion 2, I am looking a very cheap pair of speakers that I can tolerate for around 15 seconds. Really, it is much easier to accept the Diamond's sound after listening to the Companion 2, versus vice-versa. The Bose still have its pros. Strong (but possibly too much) bass, aggressive sound, the type of frequency response that people like although it is obviously wrong (I reluctantly use the term "V-shaped" despite knowing it possibly may not be actually V-shaped). But at SGD$199? Makes you think. A lot. Now, in Part 1 I could not do a proper conclusion because the Companion 2 costs half of a Diamond setup. But this time I have speakers that are currently worth around the value of the Bose considering the age (in terms of mileage) and the age (in terms of technology). It was cheap when it was still being sold. It is more than ten years old. It does not have kevlar woofers, curved surfaces or flared reflex ports. It used what I positively believe are bipolar electrolytic capacitors. (Past tense, because I replaced them with film caps that are about the same size.) It is something I will never sell since the price it will command in its current condition grossly understates its performance in its current condition. The size difference between a 5-inch and a 6.5-inch speaker became very obvious when I place the Atom on top of the Diamond 8.2. No picture of them on top of another sorry, but from the picture of them in the test setup you can see the Diamond 8.2 really shouting that it is a bloody 6.5-incher. Sidetrack a bit, testing the 8.2 has taught me that 5-inch is the optimal sweet spot for speaker size for speakers placed close to you. It is the smallest size needed for a value-for-money performance while not being too big for a small space. Sure, if you have the space, go big, or rather if you have lots of space you need big woofers to fill up the space. But if you don't have the space then the large size of the speakers become a liability. For example the lack of space between the speakers, and too much bass. The sound of the Atom is still the same as what I remember. Except after listening to the Diamond 8.2 the Atom sounds totally unspectacular. The sound is alright, but there is nothing that particularly stands out, because the Diamond just does everything slightly better on the whole. "Normal" is one way to put it, "lame" is another way. Except for the high frequencies which the Atom is still as liberal as ever with. (Yup even the bass which I think the Atom is good at, it loses to the 8.2 at the extreme low frequencies. The whack needed in certain songs just isn't there.) Maybe some burning-in will do the trick. Back to the Bose Companion 2 review, this time comparing it against the Paradigm Atom. In terms of the general feel of the sound signature/frequency response, the Atom and the Diamond are largely similar as all decent ≥5-inch bookshelves should be. The Companion 2 is still very bassy, and has noticeably more of the deep-end than the Atom v.1. If we ignore the vastly different frequency responses, the difference in voice quality is now closer between this two speakers, with the Atom being on top. The darker and warmer tone of the Companion 2 is a good change from the Atom's abundant highs and lack of mids, but still the Bose is not suited for all types of music, or even different parts of the same song. Furthermore, at this point I felt that the Atom was having more highs and less warmth than I remember, and I believed this can improved back to the performance in memory via placement. Now the Audioengine A5 looks small. The 3 bookshelf speakers sound similar to each other once again, with Atom sounding more like the A5 (due to Diamond 8.2 having the advantage in bass). And yea... the passivized A5 has less bass and treble than Atom, the way we know it. The A5 trades treble and bass volume for better sound quality; with the Companion 2 as the middleman for comparison, for voices the Atom is closer to sounding like Companion 2 compared A5 (sounding like the Companion 2 at this is a bad thing). The A5 is closer to the Diamond 8.2 after it has been stripped of quite a bit of frequency range and STILL have overall quality reduced by a bit. This time there is no salvation for the Bose Companion 2. The sound is just so different that it is not possible to use it for general daily use, despite initially sounding acceptable before I listened to the other speakers. This time, for S$199, it is highly unrecommended, because the advantage of huge bass becomes a huge disadvantage instead. Get a 2.1 that can adjust the bass volume, or a 2.0 that has less bass to begin with. The Creative Gigaworks speakers become a possible alternative. To begin, once again the effect of room acoustics is proven. But this time it results in a 180 degree turn of the evaluation of Bose Companion 2. Get appropriately-sized speakers for your location. Bigger is not always better - 6.5" is definitely too big for my location, with freaking bass running around. Previously the Bose was preferred over the Creative. But this time the Creative is probably the better one. This is the outcome of multiple changed variables, but the point is I can confidently make this conclusion. This is because the speakers' performances have been compared relatively to each other in the YouTube video I linked to in part 1. Due to many variables, it is hard to predict if a speaker is better than another for a particular scenario, while how a speaker sounds relative to another is a more certain fact. This is why such direct comparisons are useful and important, and why I only review speakers when I have two of them in my room. 3-way comparisons tell you more about the speakers. (And 2-way comparisons are better than relying on memory but this should be pretty clear by now.) I actually did a 4-way but whatever. With a third speaker I could more clearly see the advantages of different speakers, unlike in the passivized A5 vs Atom v.1 review in which I focused on the Atom's advantage in frequency range. This time the general quality of the A5 is more emphasized, and possibly suggesting that the A5 is a better speaker than the Atom, a reasonable conclusion due to the massive price difference. Test, test, test. Retest, retest, retest. Even direct comparisons cannot be trusted anymore, unless you settle everything with numbers. Get the speakers, listen to them, decide if you want them.